Flash: At least I actually get to WEAR my costume on MY CW television show. I see that movies titles aren't the only thing you're listed second in. 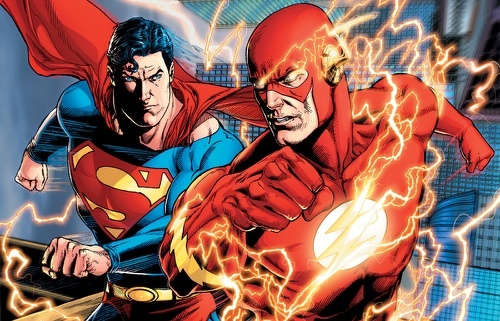 SUPERMAN: It started with Flashpoint! This whole thing is YOUR fault! Superman: BARRY GET BACK HERE!!! Someone has to spank you for rebooting the multiverse!!! Flash: I JUST WANTED MY MOMMY!!! The Flash: Hey supe's, does the S stands for slow? Flash: We've been running for over an hour and he's been keeping up. Look at his face, He looks so determined! Superman:...Must keep straight face... running for so long....given myself a wedgie...Damn you underwear...Note to self.... need new costume...no more underwear.